Putting a group of young scientists, mathematicians, technicians and electronics students in the same room was rather a frightening idea. It was fortunate therefore that the Assembly had arranged for us to speak over the internet. My name is Aled Illtud, and I am studying Physics at Aberystwyth University. I, and a number of other STEM students, had the opportunity to discuss our subjects and how we can improve or maintain different aspects of those subjects. The conversation was held on Google Hangouts and a number of issues were discussed. The conversation began with Members of the Enterprise and Business Committee asking us why we had chosen our courses, are there prospects of a job at the end of the course and how we are enjoying the subject. 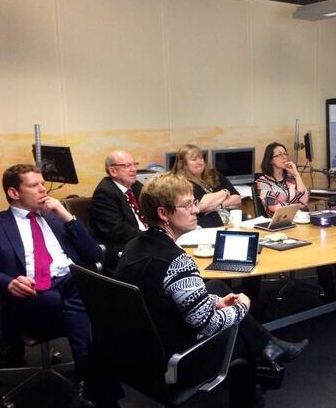 I was concerned mainly about fighting for an increase in the growth of the Welsh language within STEM subjects, which is apparent from the webchat, that is available for you to read. What surprised me most was how enthusiastic the other students were to have their voices heard. It is good to see that people are sufficiently concerned about their subjects to be able to hold an interesting discussion on what needs to be changed or maintained in their subject fields. It was good to be part of this conversation. I suggest that everyone else who is enthusiastic about his/her course should take advantage of any similar opportunities. Express your views, promote progress in your subject!